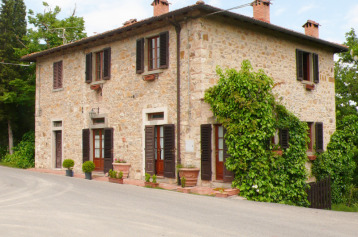 Our latest properties in Italy for sale by owner. Beautiful historical village with castle. Solidly built of stone with render. Safe to lock up and leave. Magnificent views across the valley. We have enjoyed staying in Casa Castagna for more than ten years during which time we have made it into a comfortable holiday home while retaining many of its typical Italian village house features. 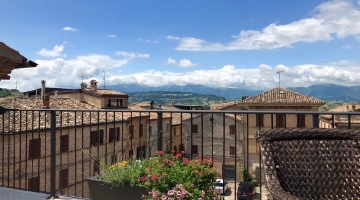 The village of Roccacasale clings to the south west side of the Monte Morrone in the beautiful province of Abruzzo, overlooking the Peligna valley. 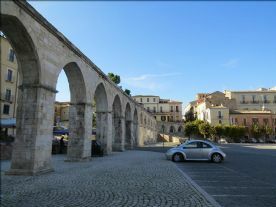 It is easily reached from Rome or Pescara, both served by economy flights, via the modern A25 autostrada and is only ten minutes’ drive from the medieval city of Sulmona. There is a large Eurospin supermarket down by the main road and others nearby. A couple of village shops sell bread and groceries while vegetables and fish are also sold from traders who visit every week. 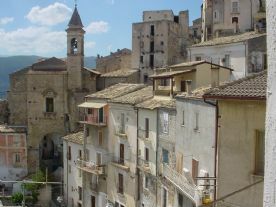 Restaurants serve the Abruzzo specialities of locally produced antipasti, pasta abruzzese and maiale alla brace, grilled pork. Of course, they offer pizzas of all varieties as well as arrosticini which are pieces of lamb roasted on skewers. The local wine is Monte Pulciano and most house wines are excellent value. 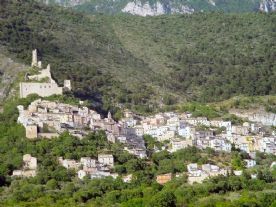 The village is on the edge of the Majella National Park and is a walkers’ paradise as there are many tracks running straight from the house and onto the mountainside. 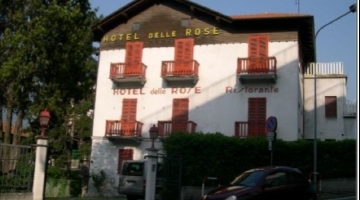 The excellent ski slopes of Roccaraso are just forty minutes’ drive away along breath-taking elevated roads and the stunning Cinque Miglia Plain. 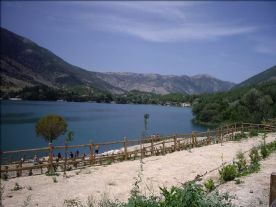 For summer holidays the beaches of Pescara beckon and there is also a local Aqua Park. The nearby area is well endowed with castles which make great visits. 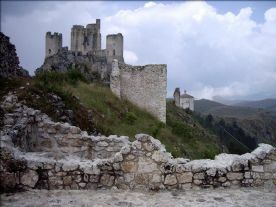 Pacentro is a beautiful village and the magnificent castle of Calascio has featured in many films. A drive to the beautiful mountain lake at Scanno is not to be missed as is a walk around the village’s jumble of streets whose impossible angles inspired the famous artwork of Escher. The house is solidly built and commands amazing views over the village and the further countryside. It sits above the very quiet Iride Bar and is approached via steps making it quite private. The house is fully equipped and furnished and would make an ideal holiday house to stay in or rent out. The front door opens onto the kitchen (20m2) with a marble staircase on the left. The kitchen houses a pellet burning stove for heating along with table and chairs, a fitted sink, washing machine, fridge freezer, microwave and electric hob. There is a doorway through to the lounge (15m2) with its simple furniture and sofa bed. There is a modern oil stove for additional heating together with a large electric fan. Upstairs the bathroom (6m2) has a loo, sink and fitted shower cubicle.The main bedroom (20m2) is spacious and has wonderful views over the piazza, the church and the valley below. There is a double bed, small sofa, hanging space and chest of drawers. It would not take much work to make an extra room in the loft space which is reached via a pull-down ladder from the landing. The roof is in good repair and is fitted with a velux window, while the floor is safe to walk on. Outside there is a small terrace and an additional walled garden behind the house. This is an ideal area for entertaining and is completely secluded. It would also be possible to develop this space into more accommodation with the necessary planning and permissions.